We recognize that you have made and investment in your lawn and landscape. Our goal at Gold Leaf is to help you protect and enhance that investment. Our lawn care professionals will use the right products at the right time of the season to protect your investment from harmful bugs, disease and weeds. Having your lawn mowed weekly is the best solution to your lawn to avoid problems and keep your property the envy of the neighborhood! Our maintenance staff is focused on protecting your lawn from the damages of time, weather, and pests. Our scheduled maintenance programs keep your landscape in beautiful condition while freeing up your time to relax and do what you enjoy. Our dedicated professionals treat your lawn as if it was one of our own. At Gold Leaf , we power edge as part of our regular maintenance package. Edging is when the over grown grass and weeds that invade your hard surface areas, like sidewalks, curbs and driveways, is cut and after completion of this process, gives your property a clean, sharp appearance. As technology evolves, we update our equipment to provide the highest quality work possible. A majority of our mowers are the walk-behind units, which are operated by hydraulics and equipped with pneumatic tires. These features reduce ground compaction, helps with turning, and limits weight damage. 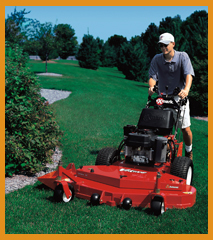 We also sharpen our blades and check tire pressure DAILY: This gives your lawn a clean, fresh cut and reduces the stress put on your grass during cutting and limits damage caused by turning the mowers. Lawn feels spongy under your foot when you walk on your lawn. Gold Leaf likes to start lawn aeration in early spring. Depending on your soil type and the traffic on your lawn, it may need aerating every second or third season. Despite all the claims about aerating your lawn by wearing spikes attached to your shoes, core or plug aerators are the only good ways to aerate a lawn. These machines pull up a core of soil and leave it on the surface of the soil. This does the best job. These machines should pull out plugs that are about the size of your little finger. It may sound like a lot of holes, but the aerator should be run back and forth until there are 20-40 holes in every square foot. The holes allow for air, water and vital nutrients to better penetrate the soil. It also gives the roots room to expand. The lawn will look somewhat rough for a few weeks, but the benefits you will see with your lawn will be well worth it. With the core aeration, the machines leave the cores on the surface to break down over the next few weeks. 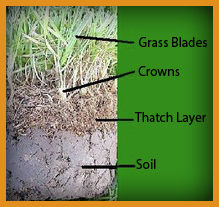 The soil in the cores contains microorganisms that help digest thatch naturally, creating a much healthier lawn. 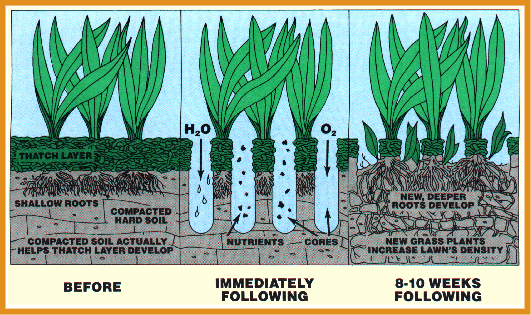 With core aeration it helps encourage a deep rooting system; increases air in the soil, improves water and nutrient penetration, and encourages growth of beneficial microorganisms. **Gold Leaf encourages all customers to consider lawn aeration to their lawn about once every year to ensure a healthy and lush lawn.